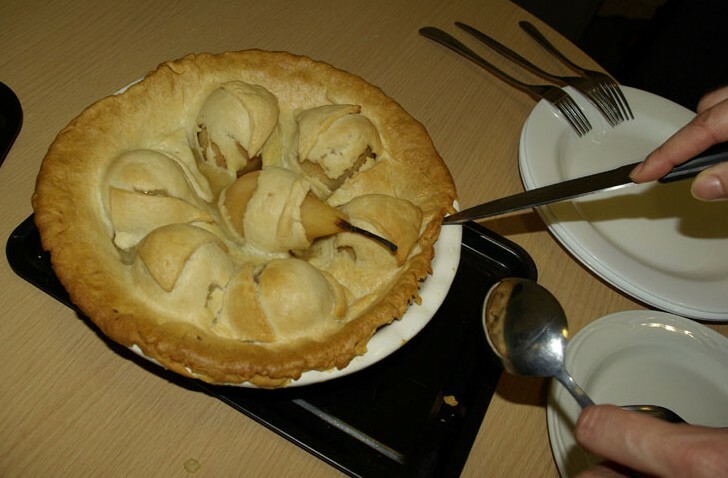 Our Warden Pie was greatly enjoyed by everyone in the Cooking Up History team. We departed slightly from the original recipe by treating our poached pears with lemon juice rather than alum to keep their flesh white. We’ve made a couple of small tweaks to the quantities we used in the session, increasing the number of pears so they sit more snuggly in the pie dish and slightly reducing the quantity of candied peel. We hope you enjoy it! You can read how our Cooking Up History group got on with the recipe here. Bake yr pears first in an oven with white bread, then make them into a pye with white sugar & canded orang peel & spice. If you like yr pears to look clear & white in yr pye, first stew them with their skins in water & no sugar but a bit of allom as big as a nut, pritty soft, & when you put them in yr pye, pare them & put a clove & a bit of cinnimon in each pear & a good dale of candid orange & lemon peel & a great dale of powder sugar, no other liquor. So bake them. When you serve a pear pye cold it’s proper to cream it, but if hot, it’s better without. Drain well and allow to cool slightly before dipping in lemon juice. While the pears are cooling, grease a 26cm pie dish with butter. Roll out half of the shortcrust pastry and use this to line the buttered pie dish. Once completely cooled, pare the skin from all of the pears. Dip them in lemon juice. Mix together the cinnamon, candied peel and sugar in a bowl. Core 7 of the pears, removing the stalk. Arrange the 7 cored pears around the outside of your pie dish and stuff the centre of each with the candied peel mixture. Embed a clove in the top of each pear. Place the uncored pear with its stalk at the centre of the pie. Scatter any remaining candied peel mix around the pears. Roll out the remaining pastry to form the pie lid. Place this gently over the pears in the dish, cutting a small hole for the uncored pear in the middle to poke through. Seal the pastry well around the outside of the dish. Bake in the oven at 180-190ºC for about 50 minutes, until golden brown. The Potato Pudding was a surprising success! It’s a simple method, and a great starting point for exploring the tastes of the Georgian kitchen. 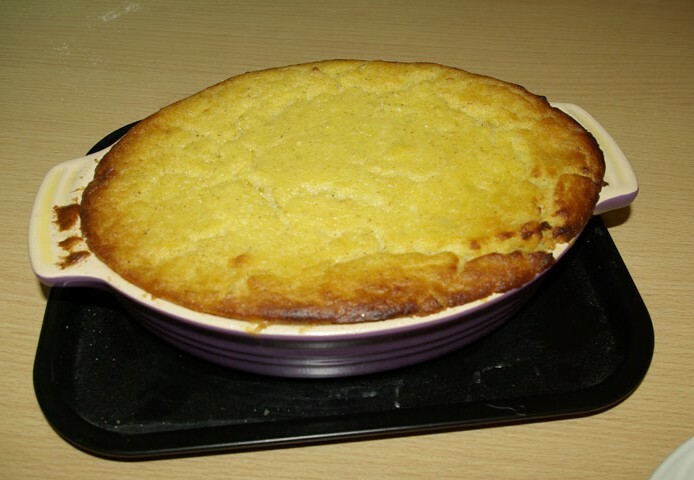 Read our Cooking Up History report on making the pudding, or have a go at this recipe at home! Take a pound of potatos boyld & peeld & cold. Pound them till smooth. Put to them half a pound of frish butter drawn, a pint of sweet cream, half a pound of sugar, ye yolks of ten eggs, two whits beat, half a nutmeg grated, a naggin of brandy. Mix these well that ye potatoes may not be in lumps. Then put in the juice of two oranges. Three qrs of an hour bakes it. Peel the potatoes, cut into large chunks. Put them into a large pan of water and bring to the boil. Cook for 30 minutes, until they begin to break up. Take off the heat, drain and allow to cool. Mash the cooled potatoes with a fork until smooth. Gently melt the butter and add to the potatoes along with the cream and sugar. Mix well. Lightly beat the egg yolks and stir them into the buttery potato mixture. Whip the egg whites until they are beginning to hold their shape. Gently fold the whites into the potato mixture. Stir in the nutmeg, the brandy and orange juice. Pour into a heatproof dish and bake in the oven at 190ºC for 50 minutes to an hour, or until golden brown.